Dallas, Chicago entrepreneurs are expanding their platform across Texas via a startup called Truss. 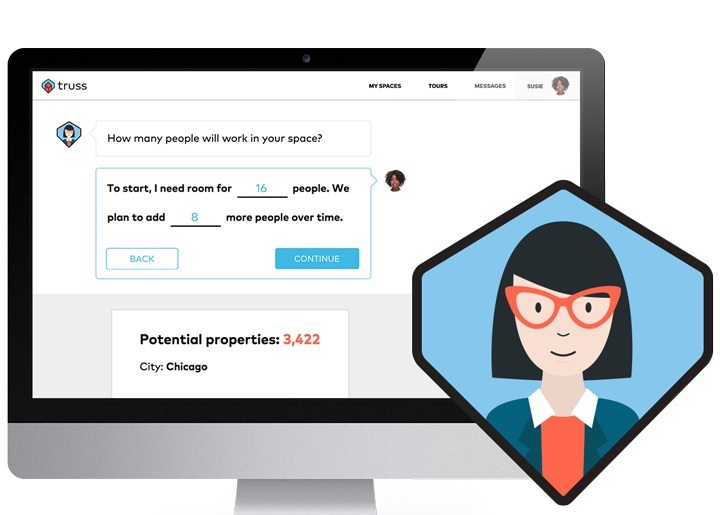 Vera is Truss’ commercial real estate chatbot that helps connect businesses with office spaces. Two Dallas entrepreneurs have joined two partners in Chicago in a venture to ease the leasing process for small- and medium-sized businesses. And they’re targeting Dallas-Fort Worth and other Texas regions as growth markets. The venture called Truss, founded in March 2016 with offices in Dallas and Chicago, uses an automated virtual system, also known as a chatbot, to help prospective tenants find and lease office spaces with less than 10,000 square feet. Via its chatbot called Vera, which uses artificial intelligence to “learn” as it gathers information, Truss aims to provide transparency through the entire leasing process and pays tenants 30 percent of the lease commission—a fee that is usually reserved for real estate brokers. Last week, the company raised a $7.7 million Series A round of funding, which was led by Los Angeles-based Navitas Capital. The funding will help Truss hire up to 10 people at its Dallas office and expand its real estate services to cover industrial and retail markets. It’s also preparing for expansion in Houston, San Antonio, and Austin. In 2016, the company raised $1.5 million in its first round of funding. Truss’ mobile platform also gives prospective tenants pricing up-front. And it converses using layman’s terms versus real estate lingo. In other words, Vera might ask how many people will occupy the space, office layout preferences, and cost per month versus size in square feet or price per square foot. Vera can handle the entire search and leasing process minus a physical tour, which Truss employees then handle. The Truss platform already has about 90 percent of office availabilities in DFW and 97 percent of availabilities in Chicago, with Dallas listing brokers, landlords, and property owners joining twice as fast as those in Chicago. Truss, which bases its Dallas office out of WeWork in Uptown, employs 15 people in Dallas serving roles in customer service, technical support, marketing, and finance. The company expects to quadruple its employee count over the next year, Smith said. Meanwhile, Truss’ Chicago co-founders Andy Bokor and Bobby Goodman are the company’s real estate expert and head of the technology development team, respectively. Smith and Marshall Hudes, Truss’ other Dallas co-founder, have spent 15 years in the Dallas market and expect to leverage their connections to expand Truss in Texas.